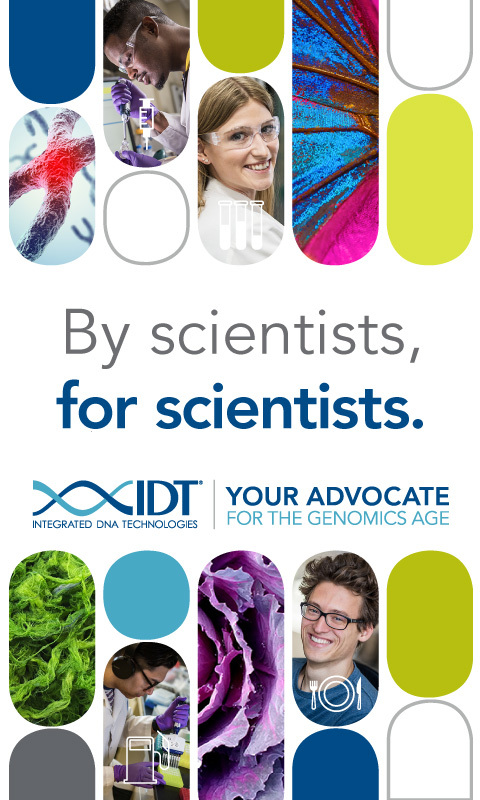 Integrated DNA Technologies, Inc. (IDT) is your Advocate for the Genomics Age. For more than 30 years, IDT's innovative tools and solutions for genomics applications have been driving advances that inspire scientists to dream big and achieve their next breakthroughs. IDT develops, manufactures, and markets nucleic acid products that support the life sciences industry in the areas of academic and commercial research, agriculture, medical diagnostics, and pharmaceutical development. We have a global reach with personalized customer service. IDT is recognized widely as the industry leader in the manufacture of custom oligonucleotides for molecular biology applications. We have developed proprietary technologies for genomics applications, such as Next Generation Sequencing, CRISPR genome editing, qPCR, and RNA interference. Through our GMP services, we manufacture products used in diagnostic tests for many forms of cancer and most inherited and infectious diseases. We maintain our leadership position through a commitment to the highest standards of quality, service, and technical expertise, which allows us to adapt to the evolving needs of genomic science. We are continually improving IDT synthesis platforms, processing technology, automation, as well as our rapid prototyping and custom part production. Our company is run by scientists dedicated to helping other scientists answer research questions through collaborative interactions. We serve more than 100,000 life sciences researchers and produce over 65,000 nucleic acids daily. The versatility of IDT products gives us a unique product-centered sustainability focus. Our products are critical tools that can help address global sustainability issues, such as biodiversity, global food security, bioremediation, and biofuels. We have therefore developed a platform, the IDT Sustainability Award, to recognize and reward our customers for research having great potential to make a global sustainability impact. IDT serves our customers through direct sales in many countries and a network of distributors worldwide. Our corporate headquarters are located in Coralville, Iowa, USA. Production sites are located in Coralville, Iowa, and San Diego, California, USA; Leuven, Belgium; and Singapore.